For the experiment, we filled the containers with water, dumped the candy in, then immediately put them in the freezer. Depending on the size of the container, there were different effects. I am assuming that this is due to the time it takes to freeze - less or more time for the candy to change state. It might be interesting to try with milk or juice as well. And of course, different kinds of candy. Larger pieces, like jawbreakers or gumballs, would be interesting. 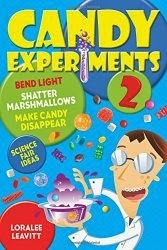 What experiments is your family coming up with? Let us know!